B) PHILATELIC DISPLAYS - acmrosh77s jimdo page! Great Britain King George V Four Penny Value Cylinder Number S 21. 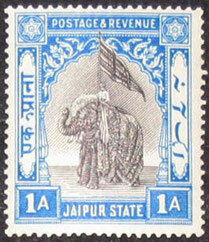 INDIA STATES - JAIPUR: 1931 1A. Value. Lundy is an island in the Bristol Channel, eleven miles from Hartland Point in North Devon. The General Post Office was closed in 1927 after 42 years and the Island's owner, Mr. Martin Coles Harman carried the mail free of charge to the mainland for the inhabitants. 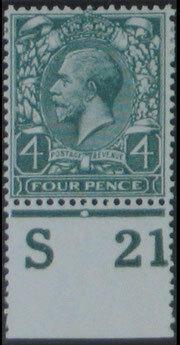 Due to the cost of this "Service", he decided to introduce his own "Private Postal Service" on the 1st November 1929. 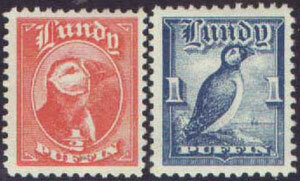 The 1929 "Half Puffin" and "One Puffin" values. To record that payment had been collected, he had two stamps printed by Bradbury, Wilkinson & Co. Ltd. and these were used for both incoming and outgoing mail. 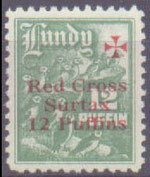 1940 "12 Puffin" Red Cross value. 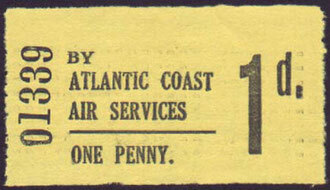 The cost of the "Service" was a Half Puffin (½d.) for postcards and unsealed letters and One Puffin (1d.) for sealed letters. 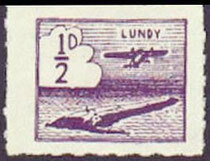 To cancel the stamps, the boxed "Puffin on Rock" dated handstamp was used. 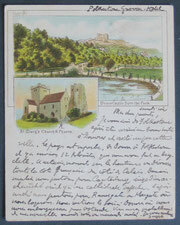 A registered cover from Lundy to South Wales. Dated 18th August 1911. These displays illustrate the Postal Service that was started by the General Post Office and the later Private Postal Service which is still running today. They also include the Air Mail Services, Postal History with Registered Mail, Social Philately, the stamp issues including the scarce World War II overprints etc. This display is made up of mainly eight and sixteen page competition entries (with supplementary material) that have had success at the Kent Federation of Philatelic Societies Rally's annual competition days. 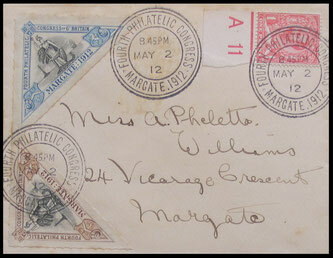 A cover used at the 1912 Fourth Philatelic Congress in Margate, Kent. 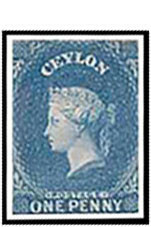 A) The Crown Colony of Ceylon - The "Corbould" issues. 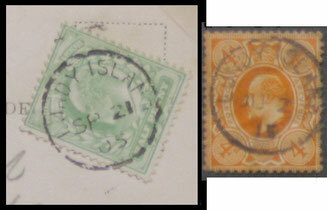 B) Cape of Good Hope - The 1864-1904 Issues. C) Australia - The 1954 Antarctic Expedition. D) The Airmails of Chile - 1934-1937. E) G.B. 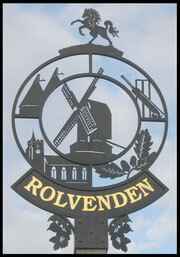 - The Postal History of Rolvenden from 1815. F) G.B. 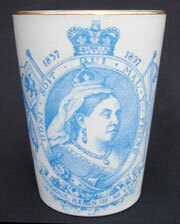 Cinderella - The 1912 Margate Philatelic Congress. G) G.B. Cinderella - The Paddle Steamer "Waverley". H) G.B. Cinderella - The Local Island Issues. I) G.B. Cinderella - The Local Railway Issues. J) G.B. Revenues - The Colour Television Licence Issues. K) U.S.A. - The Postal Cards of 1873-1914. L) Thematic - The Frog. M) Thematic - The History of Archery. 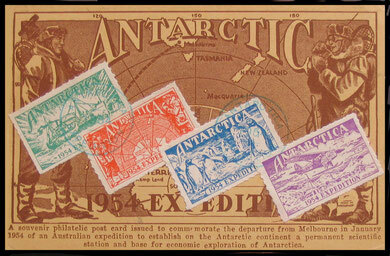 An illustrated "Antarctic" postcard showing the four different values and cancelled. 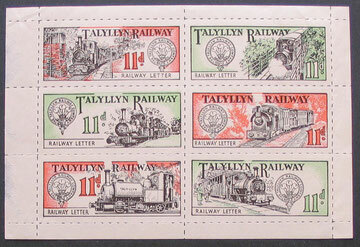 It was in 1957 that the modern "Railway Letter Service" was introduced after an agreement was signed by the Talyllyn Railway with the British Post Office and British Railways. There were different services available for the payment of the required fee and these are as follows. 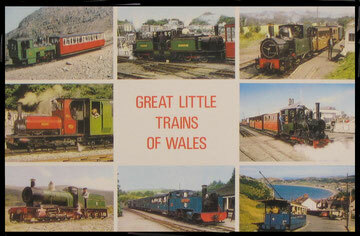 The Great Little Trains of Wales, 1970-1980 Tenth Anniversary pair in English and Welsh. A) The item is transported by the railway and posted in the Pillar Box at the end of the line for forward transmission by the G.P.O. B) The item is transported by the railway and transferred to British Rail for forward transmission to a named station on held for collection by the recipient. C) The item is transported by the railway and transferred to British Rail for forward transmission to a named station and then forwarded to the recipient by the G.P.O. Talyllyn Railway: 1965 Investiture of H.R.H. Price of Wales. Colour trial imperforated pair. For mail addressed to foreign countries. The item is transported by the railway and the transferred to British Rail for forward transmission to Paddington Station in London and then forwarded to the recipient by the G.P.O. 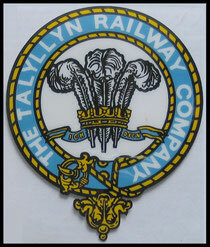 1a) The Talyllyn Railway. Their "Service" started in 1957. 1b) The Festiniog Railway. Their "Service" started in 1969. 1c) The Vale of Rheidol Railway. Their "Service" started in 1970. 1d) The Welshpool & Llanfair Light Railway. Their "Service" started in 1975. 1e) The Llanberis Lake Railway. Their "Service" started in 1976. 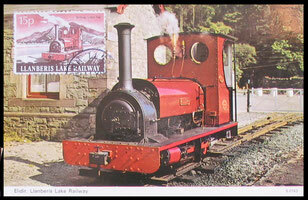 Llanberis Lake Railway: Postcard used on the 13th September 1979. The following Narrow Gauge Railways joined the "Letter Transport" agreement. 2a) The Llechwedd Slate Caverns Railway. Their "Service" started in 1978. 2b) The Snowdon Mountain Railway. Their "Service" started in 1987. 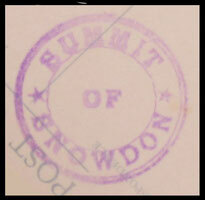 A "Summit of Snowdon" cachet. did not join either agreement. 3a) The Bala Lake Railway. 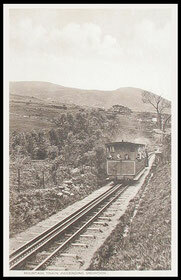 3b) The Brecon Mountain Railway. 3d) The Fairbourne and Barmouth Railway. 3e) The Welsh Highland Light Railway. 4a) The Great Orme Tramway. This display shows the different issues from the railways that joined both of the schemes with colour trials, proofs, issues, miniature sheets, covers and postcards, and also ephemera and photographs. The development of the balloon was the beginning of air transport. From the scientists with their experiments and models, to the first flights by the Montgolfier Brothers and J. Charles, and the many aeronauts with their pioneer flights. In 1670, Francesco de Lana designed the first aerial ship using balloon shaped spheres; his idea had come from air bubbles rising through water. If it had been put into practice, it would have failed due to the weight of the metal spheres. It was in 1776, in Paris, that the development of the balloon got underway, after the publication of the book by Joseph Priestley called “Experiments & Observations on Different Kinds of Air”. There were two theories for balloon construction, Joseph and Etienne Montgolfier were working on the “Hot Air” balloon and Jacque Charles was experimenting with the “Hydrogen Gas” filled balloon. It was a race to the first flight. 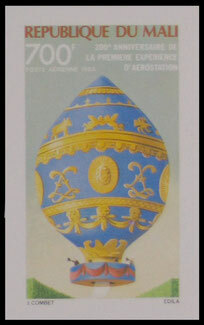 A "Ballon Montè" used on the 19th November 1870. This display illustrates 1) The Early Designs and Experimental Models. 2) The race to the first flight. 3) The Montgolfier Brothers "Hot Air" Balloon, with the First Animal Balloon Flight and the First Manned Balloon Flight etc. 4) Charles' "Hydrogen Gas" Balloon. 5) The Great Aeronauts. 6) The Military Use of Balloons. 7) The "Balloon Post", 8) Sports Ballooning and 9) Scientific Research and Use of Balloons etc. 1927 "Ballon Montè" entire to Strasbourg. 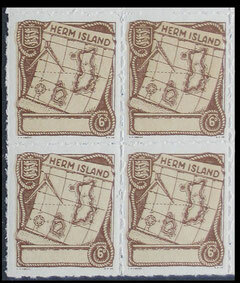 Herm Island: 1949 6d. value in corner block of four. 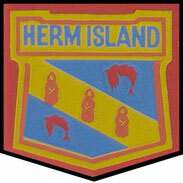 The island of Herm lies about three miles east of St. Peter Port, Guernsey in the Channel Islands and is one and a half miles long and half a mile wide. It has a small village and its main industry is tourism but dairy farming is also important. Herm had a sub post office served by the G.P.O. from 1925 to 1938. After World War II, the tenant of the Island requested for it to be reopened, but this was refused, so a local service was started on the 26th May 1949 to transport the mail from the Island to the main post office in St. Peter Port. 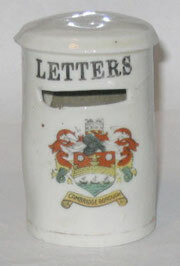 The local mail labels were issued from 1949 until the 30th September 1969. On the 1st October 1969 the Guernsey Post Office took over the mail service from the British G.P.O. and the use of all local mail labels was made illegal. 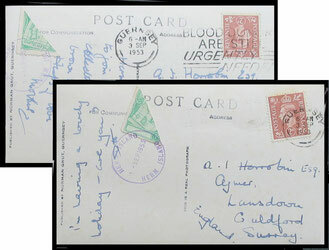 Two postcards to Guildford showing the 1953 1d. bisected. 3rd September 1953. This display shows the local mail labels from 1949, including colour trials, different printings, errors, proofs, used on covers and postcards etc. 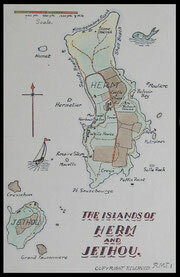 The Isle of Jethou lies between Herm Island and St. Peter Port, Guernsey, just off of Herm Island’s west coast. 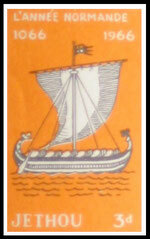 Isle of Jethou: 1962 Europa imperforate proofs. 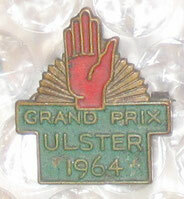 The 1966 Battle of Hastings issue. In 1960, the tenant started to operate the local postal service to the main Post Office, St. Peter Port, Guernsey. 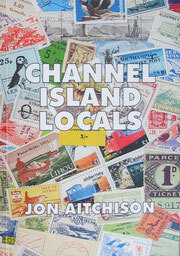 On the first few days the Island did not have a canceller for the stamps and they were cancelled on Herm Island. The Service operated until 1969 and this display shows the issues cancelled on Herm Island, colour trials, imperforate proofs, miniature sheets and used on covers and postcards etc. The Isle of Lihou lies off of the west coast of Guernsey, is joined by a tidal causeway and can be walked to at low tide. It has a farm and a farmhouse that is usually occupied by the tenant and family. In 1966, the tenant operated the Christian Youth Fellowship from the Island and issued local mail labels from 1960 until 1969 and this display shows the issues with miniature sheets and used on covers and postcards etc. a) The Commodore Shipping Company – Guernsey-Alderney. The Commodore Shipping Company held the contract to carry G.P.O. 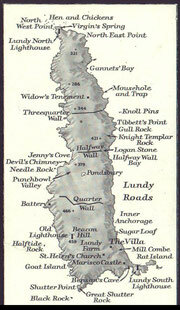 mail between Guernsey and Alderney from 1962 to 1969, when the Guernsey Post Office took over the “Service”. b) The Alderney Parcel Delivery Service. 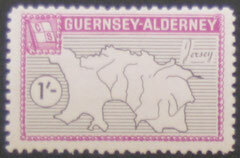 Alderney has always had a postal service operated by the Guernsey Post Office and they outlawed local “Stamps” in 1969. However it did not cover parcel delivery services and in December 1974, the Alderney Parcel Delivery Service was introduced. This display shows a selection of the issues that have issued for both companies. The Commodore Shipping Company – Guernsey-Sark. The Commodore Shipping Company held the contract to carry G.P.O. 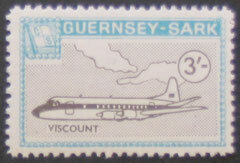 mail between Guernsey and Sark from 1950 to 1969, when the Guernsey Post Office took over the "Service". On the 1st October 1969 the Isle of Sark Shipping Company took over the contract and still carries parcels to Sark but ceased attaching stamps to them in 1999. This display shows a selection of the issues that have been issued. 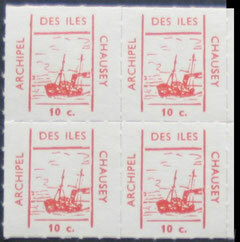 Les Iles Chausey: 1961 Boat stamp. Les Iles Chausey is a group of small islands about 45 kilometres from Jersey and 13 kilometres from Grandville. There are 52 islands at high tide and 365 at low water, but only one, La Grande Ile is inhabited. 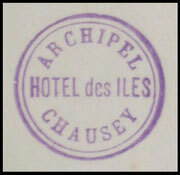 "Hotel des Iles Chausey" cachet. 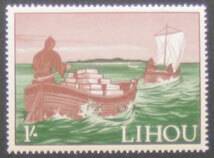 There is no French Post Office on the island, but postage stamps can be purchased from the local shops. 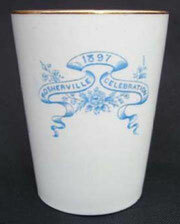 Local businesses produced cachets for postcards and their mail, which are widely collected. 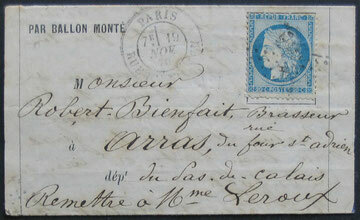 There were three local stamp issues but were quickly banned by the French Post Office. This display shows the stamps and cachets on covers and postcards etc. The Talyllyn Railway has a gauge of 2 feet 3 inches, the Talyllyn Railway is one of a number of narrow-gauge lines in north and mid Wales. It was built in the 19th century to carry slate from the Bryn Eglwys quarries near Abergynolwyn. Opened in 1865, the line runs for seven and a quarter miles from Towyn (on the Cardigan Bay coast) to Nant Gwernol, from where a series of horse-drawn tramways continued into the mountains. The slate traffic ceased in 1946 following a serious rock fall in the quarry. In 1950, the line's owner Sir Henry Haydn Jones died, and the future for the T.R. looked very bleak, as it had been losing money for many years. A group of enthusiasts, led by the engineer and author L.T.C. Rolt, sought to prevent the railway's closure and scrapping. Thanks to the generosity of Lady Haydn Jones, the Talyllyn Railway Preservation Society - the first such organisation in the world, was allowed to take over the running of the line. By then the railway was in a very sorry state with the only running locomotive in very poor condition, struggling to pull the trains along an overgrown and perilous track. 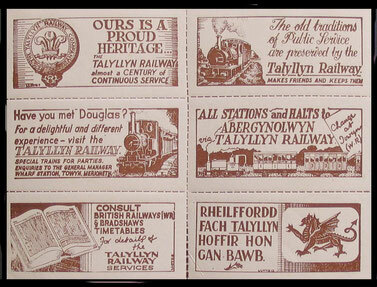 A 1956 publicity sheet of six in brown, issued to Talyllyn Railway Society members. 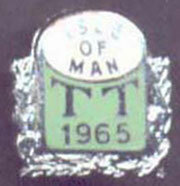 Since 1951, great improvements have been made; volunteer members of the T.R.P.S. now provide most of the train crew and station staff required to operate the line, and assist with maintenance work and with many other activities. The track has been re-laid, locomotives have been acquired and rebuilt, additional carriages have been constructed, a safe and flexible signalling system has been installed, and the many other improvements needed to cater for the much increased number of passengers have been carried out. The 1957 sheet of six stamps (red & black leading), issued on the 23rd May 1957. 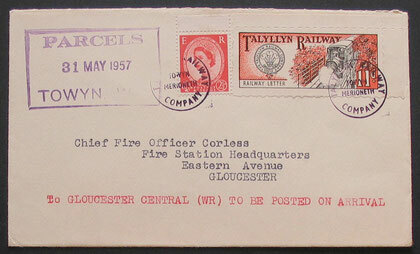 In 1957, the "Railway Letter Service" was re-introduced with the agreement with of the General Post Office. 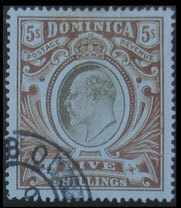 Two sheets of six stamps were issued on the first day, 23rd May 1957. 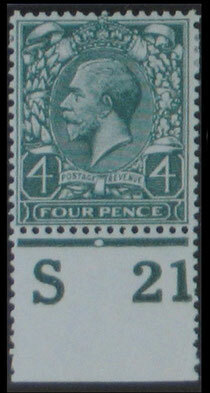 With the first stamp printed in red and black leading or green and black leading. The "Service" is still running today. 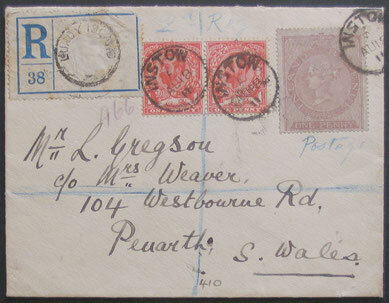 A cover to Gloucester showing stamp two (red & black), used on the 31st May 1957. This display shows the stamps and publicity labels in sheets, starting with the first issues and also a wide range of the early covers and postcards sent using the Service. 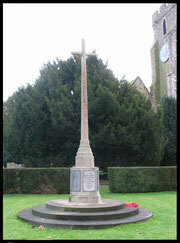 It also follows the progress of this Service to the present day.